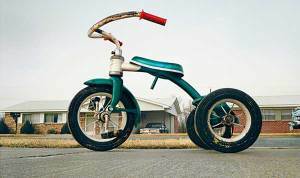 William Eggleston is a prominent American photographer who, like many artists, produces multiples, that is, limited run editions of their work. You may see limited runs for sale many times in art galleries. Generally, with a limited run, each print of the run is individually numbered. The artist signs each print and a numerical fraction is usually applied next to the artist’s signature; the numerator, or top number of the fraction, is the individually numbered piece in the run and the denominator, or bottom number of the fraction, is the total number of authorized pieces in the run. So, for example, buying 8/25 means that you purchased the 8th print out of a total run of 25 prints. The multiples are taken from the original work of art and, at least in years past, careful dye transference processes and printing processes were applied so that each limited run was of acceptable quality to the artist. Great craftsmanship and artistry went into this process. Perhaps, the original printing plates which produced the limited run were destroyed. Clearly, a premium attaches to a signed and authorized limited run piece. Just as clear is the potential for acrimony where the artist retains access to easy duplication methods and where such access can provide a quick and sizeable payday. Enter Jonathan Sobel, an avid Eggleston collector, fan and supporter. Among his large Eggleston collection, he purchased 8 limited run pieces through galleries, auction houses as well as from Eggleston and his Foundation. These pieces were “vintage” editions and were produced many years ago. All told, Mr. Sobel estimated the value of his entire Eggleston collection at between $3mm – $5mm. But then, Mr. Eggleston and his Foundation decided to take advantage of current technologies. They produced and sold completely new digital prints, including reproductions of the images in the 8 prints mentioned above and still owned by Mr. Sobel. Mr. Sobel alleged that the high quality digital reproductions were indistinguishable from his vintage limited run pieces, and that the sale of the reproductions diluted the value of his entire collection. Mr. Eggleston and his Foundation sold the newly created digital pieces through Christie’s in April, 2012 as part of a sale which netted the Foundation close to $6mm. What rights did Mr. Sobel have to protect his collection from dilution? “Not much” the New York Federal Court recently ruled. But apparently, there is little in the New York law which stops the artist from re-entering the market with a later limited run of the same work. In fact, the current law and practice is that the limited edition piece belongs to the purchaser, but the underlying image remains with the artist. That means that the artist remains free to produce different limited editions in different or even the same medium. Some commentators have written that this story is a reflection of the change in the nature of photographic art, as purchasers have expanded from the limited base of photographic fans and collectors to the much broader base of contemporary art and fine art investors and distributors and collectors. The moral of the story: Be wary of buying multiples for investment purposes!